This page has been edited. The village is named after Giant Armadillo Hill. It is a Wapichan community with a few remaining families of the Taruma people. The village is located in the Deep South Sub district in Region 9, and it is a forest edge community. There are over 812 persons living presently in the village. About another third of our residents work or live away from the Village temporarily. but return during holiday times and to visit family. Our first settlements were located at Shaoramniz, Maratino, Tooro nau long before the Missionaries came (about 100 years ago). Our Village has a land title that covers just a part of our traditional land. The land title was demarcated in 1998. The Village has submitted a formal application for extension of our land title boundaries that includes two tracts of our customary land. One tract lies to the east and covers our community forest land and the other lies westwards and covers savannah land. The results of our request for extension are still pending in 2017. The matter is being addressed as part of the formal talks between the SRDC and MIPA about our land and territorial claim, which has remained unresolved since independence from Britain in 1966. Farming, ranching, crafts, hunting, fishing, gathering non timber products, exchange labour, wage labour, Part time mining, Trapping and Trading wild life, extracting timber. Marorra Naawa Village is surrounded by mainly Ite swamps, Savannah Hills, Savannahs, Bush Island, numerous streams and water ways and Forest. There is no internet connection in the village and there is no cellular signal in the village but can be accessed from places out of the village area. The Village is governed and managed by the Elected Toshao and Village Councillors. Toshaos are now elected every 3 years. Members of the village Council are also changed and nominated at election time. The executive body of the council is made up of the Toshao, Deputy Toshao, Secretary, Treasurer, Assistant Secretary/Treasurer. Activities that the community is involved in are The Annual August Games, Heritage Month Celebrations, Rupununi Expo and Christmas fair. -	Open a trail to Kwitaro River. This is to boost Ecotourism. Marorora nawa village is a member of SRDC and all environmental issues will be dealt with jointly according to our territorial management plan and Environmental Monitoring system that the SRDC has embarked on. Also the village will work along with KMCRG to deal with Protected Areas and Tourism. 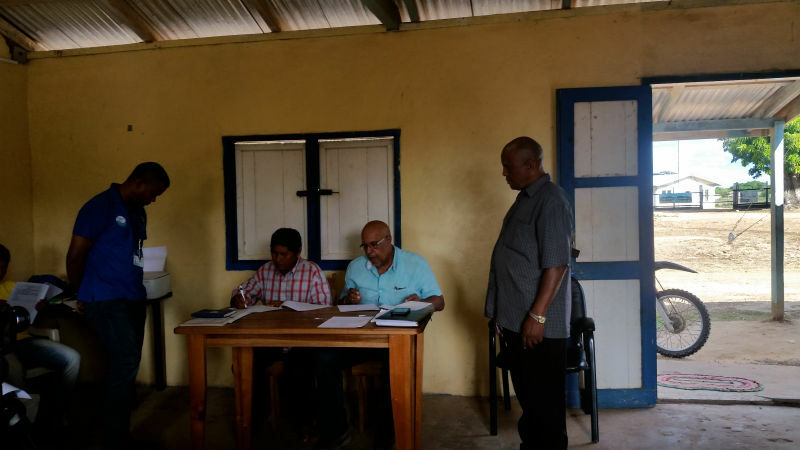 Toshao Ambrose Bento signs a contract with Dr. Van-west Charles of GWI on behalf of the village council for the distribution of pipelines to households in Maruranau Village. This website was built using the Advanced English template and tools developed by Forest Peoples Programme, a company limited by guarantee (England & Wales) Reg. No. 3868836, registered office. UK Charity No. 1082158. It is also registered as a non-profit Stichting in the Netherlands.